We’ve been in a bit of a deep freeze in the Midwest the past week. Several days have been so cold that the wind chill temperatures have been -15 to -20 degrees. This is too cold for humans to be outside, let alone your dog. The Michigan Humane Society states that small and short haired dogs should not be left outside for any length of time when temperatures (not wind chill, but temperature) is less than +15-20 degrees, and for thick coated or large dogs 0 degrees. The physical dangers of temperatures this low to humans are frostbite. With windchills at 15 degrees below zero, fingers, toes, ears, and noses can get frostbite in as little as 30 minutes. If the windchill drops (like it was in the Northeast) to 55 degrees below zero, you can get frostbite in as little as 5 minutes, according to the National Weather Service. What’s the point? Your body shifts blood flow away from appendages and exposed skin like fingers, toes, ears, and noses to protect your core in extreme conditions. Your dog is a mammal and functions the same. Her paws, ears, and even her nose can suffer the same consequences. If you’re reading this, you are probably not the type of person that keeps an outdoor dog. If you are, you must bring them inside. It is considered cruelty and a crime (yes, a punishable crime) to leave them outside in these conditions. The downside is that our dogs are housebound and can get a little…wound up. Play in the house doesn’t take the place of a good walk. It helps, but it’s just not the same. So when temps return to something tolerable, what can we do to help our pets be comfortable? Not every dog needs a coat. A Siberian Husky is built for the cold. A Chihuahua might freeze to death. Breeds in the middle- you might have to make a judgement call based on your dog and the temperature. 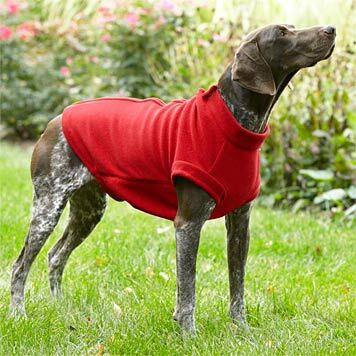 These dog coats from Motley Mutt are thermal jackets- and they even cater to specific breeds- Great Dane, Greyhound, and Whippet- because of specific body requirements. Great idea! For not freezing temperatures (but still cold), maybe a fleece is in order. Reggie has one, and as I’ve mentioned in previous posts he’s not the biggest fan of clothes. But I bought it when he was first adopted and he tolerates it particularly when it’s cold. This Orvis fleece is the new model of the fleece that Reggie has (a zipper would be easier!). Yep I bought Reggie boots. Because of his mixed breed status, he does not have big paws. He inherited the lab-ness love of water and webbed feet, but he has long skinny legs and tiny little paws. He is dwarfed in body size by “real” labs whenever he is next to one. He loves the snow, loves rolling around in it, jumping and frolicking like a gazelle whenever he gets outside. However, he will at a certain point start holding up his paws because snow or ice has become impacted in between his toes (common in webbed feet dogs) or his paws are just plain cold. So he got boots. And then he ran around and lost one in the snow. So, put on boots for walking not playing. They will protect your dog from cold, ice melt or rock salt that has been put on sidewalks or roads (this can be absorbed through the paws), or ice. 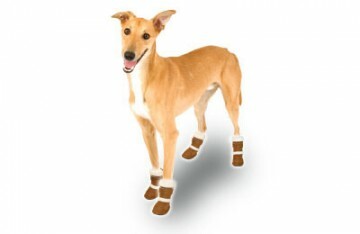 Muttluks are fleece lined and Canada-approved! Great for cold weather and tough terrain, these should stand up to any frolicking that happens in the backyard or neighborhood street- and stay warm. Pugz, a play on the popular human Uggs, are more fashion than function but adorable nonetheless. If your dog is the type to actually get used to wearing boots and keeps them on instead of trying to bite them off, then the fuzzy interiors will probably keep them warm and these will be awesome. Remember to take care of your dogs, they are family too. If it’s too cold for you to be outside, then it’s too cold for them too. Protect your dog when it is appropriate to be outside and everyone will be happy and healthy!